Ambulance staff said the van would be "absolutely invaluable"
Cornwall's air ambulance has bought a promotional van to boost its 20th anniversary fundraising campaign. Five years of guaranteed sponsorship by Jobline Staffing enabled the charity to buy the van instead of leasing it, which was less cost effective. 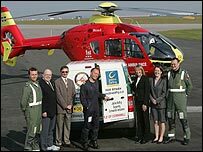 The van has colourful images of the charity's aid helicopter. A charity spokeswoman said: "The new promotional van will be absolutely invaluable, keeping the air ambulance at the forefront of people's minds." She said: "We fly over 1,000 missions every year, and the ongoing support of the Cornish public is absolutely crucial to keep this essential service going."